Our traditional style home is bright and cozy and the perfect place to call your "Home Away from Home." Our guests will have access to the entire home which includes 2 bedrooms, 2 bathrooms, a walk in closet, patio, and TV room. 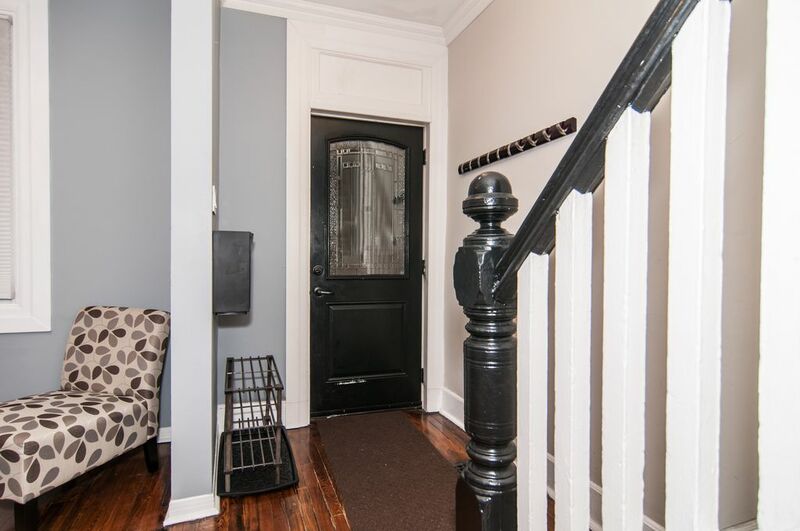 Located in a great location in the Glebe, it is just steps away from Lansdowne Park, TD stadium, the Rideau Canal, restaurants, shops, pubs, boutiques, grocery stores, movie theatres and much more! A very comfortable and cozy space with lots of natural light, partial antique flooring and narrow staircases. Spread out over 3 levels, guests will have to be able to climb 2 sets of stairs to reach the bedrooms or the media room on the lower level. The kitchen is well supplied with dishes, pots and pans and all the basic fixins' for a Do-It-Yourself breakfast in the morning. Guests will be provided a personal access code prior to their Check-In day. This access code will be valid throughout their stay and will grant our guests access to come and go as they please, without a key. (*Please note: if a late check- out is required, arrangements must be made in advance as the access code will expire and arrangements need to be with our cleaning staff). Guests will have access to the entire home. There are no shared spaces. We provide "self serve Check- In" via personal pin after 3 pm. We will give you space and privacy to enjoy our home and surrounding area, however we are quickly available by phone, email or text if you have questions or require assistance. Two guest street parking passes are available for our guests but subject to availability (events at Lansdowne or city of ottawa snow removal). Underground parking is also available at TD stadium for $20/day. (Steps away). You can walk, bike (rentals available nearby), taxi, Uber or take the public bus to all major attractions. Major public bus line #6 and #7 are a couple blocks away and takes you to Parliament building and Byward market in approx 15 minutes. We love Ottawa and are very excited to share our home with you. In our spare time, we love to travel aboard, meet new people and explore new cities and cultures. If we can't travel abroad, we also enjoy staying local! We love trying out new restaurants and exploring all the different activities our city has to offer... and trust us- there are so many things to do! We are located in the Glebe! This is one of Ottawa’s older and more prestigious neighbourhoods located just south of the downtown area. Here you will find mature trees, early 20th century homes and the beautiful Rideau Canal. You will fall in love with the local shops and restaurants along Bank Street. We are also steps away from Lansdowne Park. Here you can enjoy Ottawa’s VIP cinema, restaurants, shopping, grocery stores and TD Place. You can catch Ottawa’s Red Blacks football team in action, or enjoy your favourite musician when he/she comes to town! Washing Machine is located on the property. We supply laundry detergent for your convince. Not share with others. Dryer is located on the property. Not share with others. 2 guest street parking are available to our guests but subject to availability (Events and Lansdowne or City Ottawa snow removal). Underground parking is also available a the TD stadium for a fee. Towel provided depending how many guest are staying. We have high speed WiFi. provide dishwasher soap located under the sink. We have bread, eggs, butter, jams, creams etc for our guest to have access to. Large Microwave located over the stove. We have a coffee Maker and provide free coffee to our guests. We have a Flat Screen LCD TV. We also have a RUKO streaming player which allows you to access your own Netflix, Amazon Video, Hulu account. Please log yourself out of your account before you leave. We have a selection of DVD to choose from. We have different genres of DVD to select from : kid movies, adventure, teen, horror, comedy. We have a patio set (seasonal). We had a great stay. near restaurants and Landowne Park. neat and clean, well stocked.. A Whole Foods a block away. This rental is in an awesome location; walking distance to events venues, the canal, shopping, many restaurants and more. Couldn't have been happier with being located in this trendy new area! The hosts surprised us with all the fixings needed for breakfast and some evening snacks. This was really appreciated. Washrooms and bedrooms are up or down a flight of stairs. We are from Ottawa, but currently live overseas. We were looking for a place in our 'old' neighbourhood so that we could be close to friends and so we would be familiar with the area. We had previously stayed in apartment hotels downtown which were rather sterile. From the time we walked in, we could tell that we had made a great choice. The house is half of a side by side double, and is cosy but very well equipped. It would be regarded as being small for a home but it was certainly enough space for us (couple with a child) and a pleasant alternative to an apartment. The place was immaculate, and there were even some goodies already in the fridge for us to use. On-street parking was perfectly adequate, in fact we managed to get a space right in front most of the time. The house was very quiet despite being a stone's throw from the Lansdowne development - this is actually a bonus as there are many restaurants to choose from. Contact with the owners was very easy and they were responsive. Access was via a code so we did not even see them, but it was comforting to know that they were just an e-mail away. We were very happy and wouldn't hesitate to stay here again. Lots of nice little extras including breakfast makings and cosmetics. Very clean and well equipped. Charming old home full of character. A short walk to shops restaurants, the canal and landsdowne. Plenty of on street parking and easy to access. Deo and Kim are easy to deal with. We visited for Winterlude, it was an easy walk to a mid canal access point (5 street). Deo And Kim were extremely helpful and responsive to all of our questions. We parked the car and never needed it again, as we walked or skated everywhere. The home was very clean and cozy, with nicely equipped kitchen, small but comfortable bedrooms and a delightful living room for evening wine and cheese. The location could not have been better, lots of interesting restaurants / bars, shopping and even a Whole foods. This was our first VRBO rental and we could not have been happier. Lansdowne has transformed with time to better fit the increasing modernity of the great world capitals. Located in close proximity to downtown, this community is vibrant and lively. Easily accessible using public transit lines 1 and 7, and flanked by the Rideau Canal and Bank Street, Lansdowne has numerous amenities that make it a unique space. A trade hub whose history began with the construction of the Aberdeen Pavilion in 1898, today Lansdowne is firmly focused on the future with a completely renewed space dedicated to sports, culinary experiences, the art of living, culture and leisure. The TD Place Stadium alone shows the community’s ambitions. It’s an ultramodern sports complex, which regularly hosts Redblacks football games and Fury soccer matches as well as the young and talented 67’s, who are progressing in the Ontario Hockey League, in the arena located under one of the stands. Up to 24,000 fans can fit into these stands for the big nights, which makes for a great atmosphere. The stadium also hosts large international competitions, like the last FIFA Women’s World Cup, which energized fans of all the countries represented at Lansdowne Park. The TD Place Stadium isn’t just a hotspot for sports. It’s also a major venue for world famous musical acts. Plenty of concerts take place each year in the arena and the stadium, such as Def Leppard, AC/DC and The Piano Guys. And if your favourite band isn’t playing yet, be sure to plan a special night at the Lansdowne Cineplex, a brand new complex with features such as VIP theatres to watch your favourite movies in the utmost comfort with luxurious seats, in-seat service and a special menu. What’s more, parking is free with your movie ticket! For the simple pleasure of sharing a good meal with friends or family, before or after a game, Lansdowne offers many possibilities for dining in a casual and accessible atmosphere. Take, for example, the famous Jack Astor’s franchise, known for its tacos, nachos and burgers and its large selection of beers, or JOEY with its menu full of flavours and specialties from around the world. More classic, but just as popular, South St. Burger Co. serves their burgers in a New York–style atmosphere, while Milestones puts a brilliant spin on the great culinary classics. Regardless of your tastes and budget, you’ll definitely find the fare for you at Lansdowne! What would Lansdowne be without its traditional and much-anticipated Farmers’ Market? Year-round, inside the Aberdeen Pavilion or outside, many merchants, farmers and artisans sell their fresh products, creations and prepared dishes. Seasonal fruits and vegetables, practical ideas, local bread and pastries, drinks, organic product stands… the market is brimming with great ideas for your table. Whether you like to cook for your family, your friends or yourself, or you just want to taste the local specialties, the market is the perfect occasion. Just a five-minute walk away, on Bank Street, the famous Whole Foods Market also has a particularly well-stocked establishment that emphasizes products that are organic, local or environmentally friendly. Good values to shop well and eat well, with direct access to the underground parking lot connecting all the stores in the area. Finally, the art of living also includes “living well” at home. Beyond the ultramodern and luxurious apartments that surround the area, the Structube store, specializing in modern designer furniture, should give you countless ideas for interior design or renovations! Lansdowne is also a lively area for solo or family leisure activities. Winter is full of adventures with free skating on the rink in the heart of the area, or on the Rideau Canal, which is very close to the park. In the summer, the skate park, kids’ play structures and fountains will delight young and old. And if you want to just take your time, the park that surrounds Lansdowne is great for walking, with its numerous green spaces.